Small aperture low voltage AIR-TITE housing for task and accent lighting where housing will be in direct contact with Insulation. Lampholder on trims adjusts 40" from vertical (eyeball trim adjust to 30"). The AIR-TITE construction limits air exchange between the plenum and heated or air conditioned areas.The housing is designed for MR16 lamps. 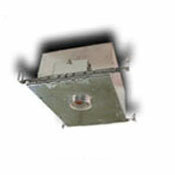 ·120V magnetic transformer. Integral thermal protector guards against Improper lamping.. Double wall housing construction. -Junctlon box is listed for through branch circuit wiring and has seven 1 1/2" knockouts, with true pryout slots and four Romex pryouts with Integral strein relief. Pre-lnstalled,captive bar hangers allow housing to be positioned at any point within a 24" Joist span. Unique arrowhead design provides "Nailless installation. Bar hangers can be repositioned 90·without tools. Hangers fit onto T-Bar spline ,for quick alignment and can be permanently secured with optional T-Bar clip. 7 1 1/4" Height allows use In 2"x8" joist construction. .
Housing can be removed from plaster frame for junction box and transformer access.